The 250 championship may be wrapped up, but there is still plenty on the line. Entering the second and final moto, Lucas Oil/TLD Honda’s Jessy Nelson was seeking his first career overall, while dark horse Joey Savatgy was hoping to keep the momentum going after a fourth in moto 1. It was Nelson at the start, securing his second holeshot on the day over Savatgy and Jason Anderson. Nelson opened a gap on Savatgy early, while the French duo of Marvin Musquin and Christophe Pourcel began to charge toward the front. The muddy terrain would bit Nelson, as he lost control and nearly gave up the lead. Savatgy pounced on the mistake and passed Nelson over the finish line, giving him his first lead of the day. Nelson would continue to lose positions, eventually finishing eighth. Savatgy held a four second gap over Musquin at one point, but it disappeared quickly. Musquin rode the edges to secure the lead. Savatgy lost another position late to Pourcel and would finish third—his first career moto podium. Pourcel made a last ditch effort on the final lap, pressuring Musquin all the way to the finish, but Musquin held on to secure the win. Pourcel would finish second. Blake Baggett, Cooper Webb, Dean Wilson, Alex Martin, Jessy Nelson, Justin Bogle and Jason Anderson would round out the top ten. Jeremy Martin, the newly crowned 250 Champion, finished fifteenth. The first ever Indiana National provided a big turn in the championship chase. Entering the race down just 7, Ryan Dungey seemed to have the momentum with four motos left. Ken Roczen stopped the bleeding with a moto 1 win, and extended his points lead to ten. The points gap would widen in moto 2, as Roczen gained another ten points on Dungey. The difference is now twenty with two motos remaining. Just one week after winning his first career 450 AMA Motocross National at Unadilla, Trey Canard made it two wins in the last three motos after grabbing the holeshot and running away from Roczen. Dungey was buried off the start, lost his goggles early and was never able to make a charge toward the lead. One mistake seemed to be compounded by another, as Dungey lost the momentum he carried into the race. He finished ninth in the second moto. Ryan Sipes walked away from pro motocross at the beginning of 2014. Seven months later he was back on the podium. Sipes, who began the season racing GNCC, and will return to the series after Lucas Oil Pro Motocross, survived a late crash in the moto to hold off Andrew Short for third. Josh Grant and Chad Reed would round out the top five. After battling for a podium position early, Weston Peick would finish seventh. Fredrick Noren, who started dead last after he appeared to have bike problems on the gate, would charge back to finish eighth. 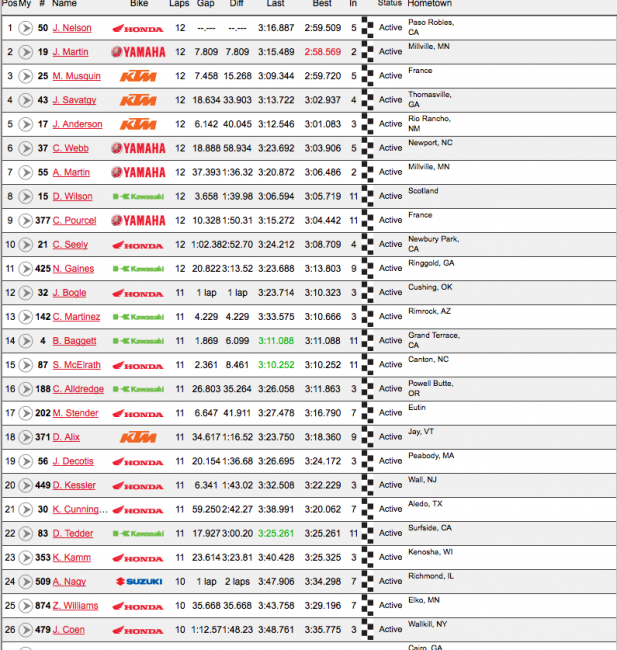 Dungey finished ninth, with Eli Tomac rounding out the top ten. Entering the penultimate round of Lucas Oil Pro Motocross, Yamalube/Star Racing Yamaha’s Jeremy Martin needed just nine points to claim his first career 250 Motocross Championship. The Minnesota native didn’t want to wait until the second moto in less than ideal conditions. He wanted to put the championship on ice. Lucas Oil/Troy Lee Designs Honda’s Jessy Nelson would lead the field into turn one, but Martin was able to tuck in behind—setting a good pace early. The KTM trio of Joey Savatgy, Marvin Musquin and Jason Anderson filled out the top five early. Nelson opened a three second lead early with Martin settling into a pace he could maintain. With Blake Baggett having his troubles—including having to pull into the pits for new goggles—Martin didn’t need to win, second would suffice. Nelson stretched his lead to over seven seconds by the end of the moto—claiming his first career moto win. Martin would finish second to claim his first career championship. Musquin, Savatgy and Anderson would give KTM three of the top five positions. Cooper Webb, Alex Martin, Dean Wilson, Christophe Pourcel, who came from nearly last, and Cole Seely would round out the top ten. A muddy racetrack has a tendency to make even the best riders in the world look rather pedestrian. It’s often the great equalizer. In Ken Roczen’s case, it was the great advantage. The German born KTM rider dissected the muddy Ironman Raceway and cruised to the first moto win by more than forty seconds. With the moto win, Roczen extended his points lead to ten over Ryan Dungey with just three motos remaining. Roczen was in cruise control from the beginning, grabbing the early lead and controlling the tough conditions. 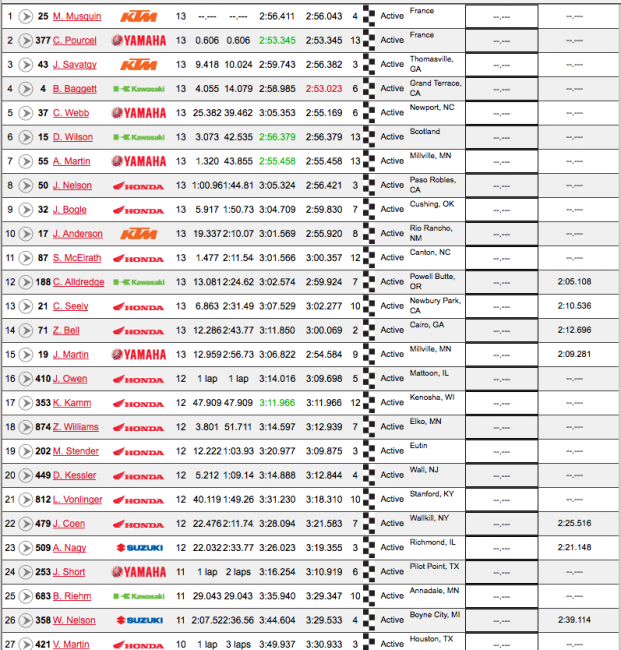 Trey Canard and privateer Mitchell Oldenburg would tug in behind early, while Dungey was buried in around fifth. Fastest qualifier Eli Tomac had troubles early and had to pull in for goggles. He would rebound to finish fourth. Buried in fifth, Dungey, trailing by seven entering the moto, had to make a move to salvage points. He worked his way into second early, and then got by Canard after he went down to cut the points gap to ten. Out front Roczen was in complete control, though, and won the moto by nearly fifty seconds. 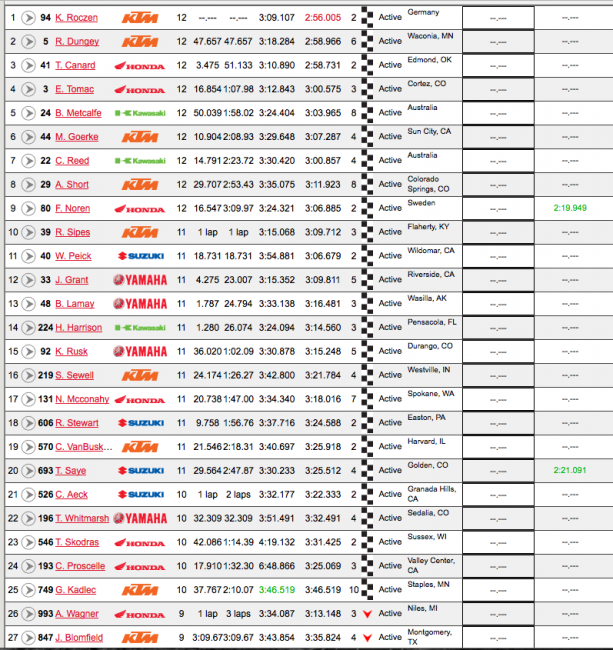 Dungey would take second with Canard in third. Tomac made a late pass on Brett Metcalfe to capture fourth. 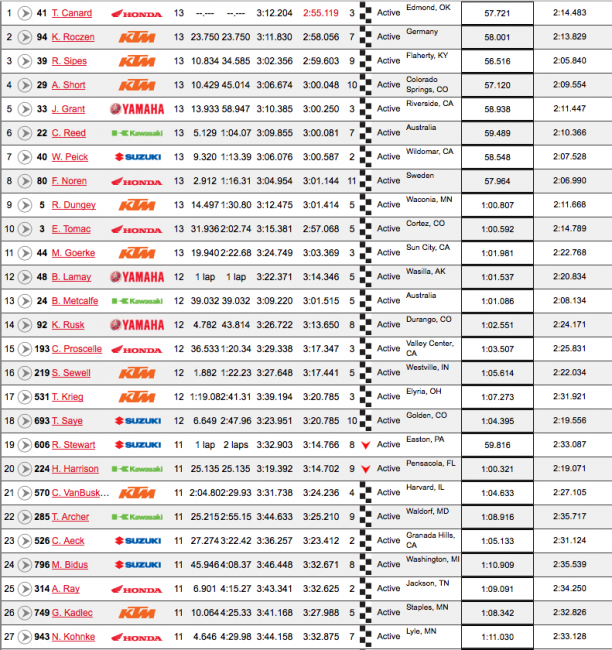 Matt Goerke, Chad Reed, Andrew Short, Fredrik Noren, who came from way back, and Ryan Sipes would round out top ten. Oldenburg's bike let go late in the moto and he finished 30th. A rain soaked morning has come to a conclusion at the inaugural Indiana National, the penultimate round of Lucas Oil Pro Motocross. Heavy showers broke around 7:30 a.m. and continued throughout the morning. At this time the rain has passed, but there is a possibility we could see more later this afternoon. The heavy rains have made for a rain soaked, muddy, slick track. Throughout practice you could see riders struggling to mush through the new venue. Corners are causing problems, with multiple riders getting stuck in practice. Due to conditions many riders opted to ride just one practice—only doing a few laps—which caused a huge shakeup at the top of the leaderboard. 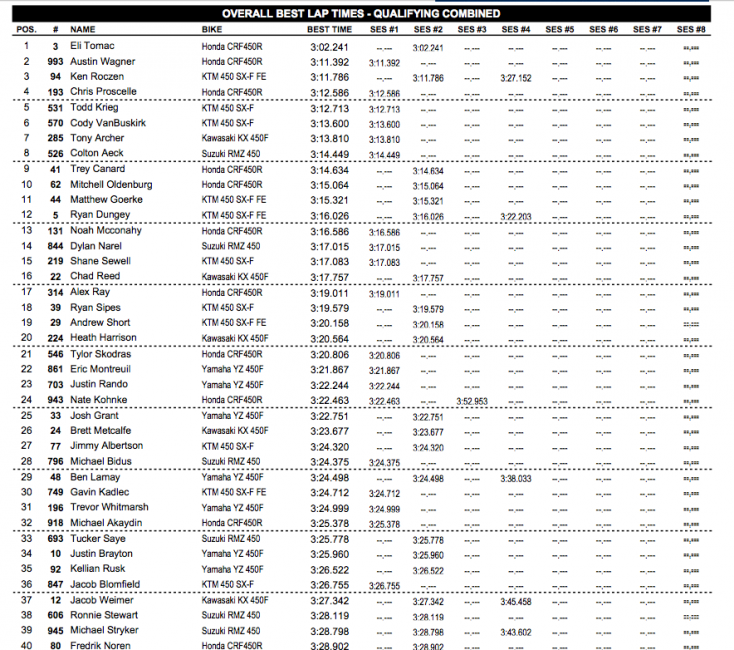 450 Group B thrived under better track conditions with six of the top ten combined times coming from that group. This also lead to a few Group A riders failing to qualify, including Michael Byrne and Cade Clason. In 450 qualifying, Eli Tomac wrote the book on how to deal with adverse conditions, setting a 3:02.241. His time was more than nine seconds faster than Austin Wagner—no, that’s not a typo—who finished second with a 3:11.392. Points leader Ken Roczen (third with a 3:11.786), was flanked by a handful of privateers, including Chris Proscelle (fourth), Cody VanBuskirk (fifth), Tony Archer (seventh), and Colton Aeck (eighth) inside the top ten. Ryan Dungey, who has won two straight overalls entering the weekend to close the gap on Roczen to 7, was twelfth fastest. In the 250 Class, points leader Jeremy Martin ended Christophe Pourcel’s run of Oakley Bomb Awards capturing the top spot with a 3:14.028. His time would just clip Pourcel, who set a 3:15.966. The 250 Class didn’t see quite the shakeup the 450 Class did, as only two privateers (both from Group A), Dakota Kessler (eighth) and Cole Martinez (tenth), qualified inside the top ten. Martin’s Yamalube/Star Racing teammate Cooper Webb (3:19.216) would finish practice in third, with Jason Anderson (3:22.898) and recent Loretta’s graduate RJ Hampshire (3:24.584) rounding out the top five.